As per the latest trend, our IBPS Guide is providing the updated New Exam Pattern Quantitative Aptitude questions for SBI PO 2019 Day 10. Our Skilled experts were mounting the questions based on the aspirant’s needs. So candidates shall start your preparation and practice on daily basis with our SBI PO pattern quantitative aptitude questions 2019 day 10. Start your effective preparation from the right beginning to get success in upcoming SBI PO 2019. Directions (Q. 1 – 5): What value should come in place of (?) in the following number series? 1. 312, 156, 104, 78, 62.4, ? The pattern is, *1/2, *2/3, *3/4, *4/5, *5/6,..
2. 114, 231, 689, 2761, ? The pattern is, *2 + 33, *3 + 43, *4 + 53, *5 + 63, *6 + 73,…. Directions (Q. 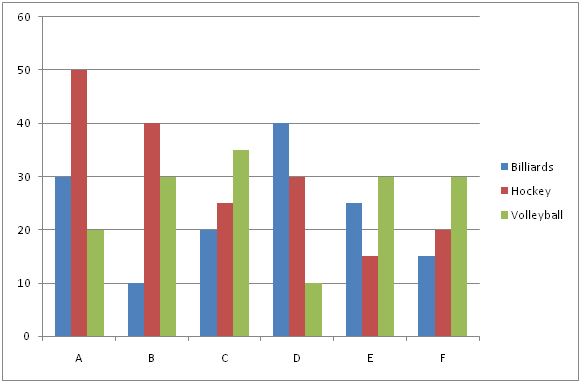 6 – 10): Study the following information carefully and answer the given questions: The following bar graph shows the total number of students playing different sports from various schools. 6. If the ratio between the total number of boys to that of girls playing Hockey from school A and B is 7 : 3 and 5 : 3 respectively, then find the difference between the average number of boys to that of girls playing Hockey from both the schools A and B together? 7. Find the average number of students playing Hockey from all the given schools together? 8. Total number of students playing all the given sports together from school C is approximately what percentage of total number of students playing all the given sports together from school F? 9. Find the ratio between the total number of students didn’t play any sports from school A to that of total number of students from school D, if the total number of students playing all the given sports together from school A is 25 % of total number of students from school A and the percentage of students didn’t play any sports from school D is 80 %? 10. Find the difference between the total number of students playing Billiards to that of Volleyball from all the given schools together? 1) 312, 156, 104, 78, 62.4, ? 2) 114, 231, 689, 2761, ? The following bar graph shows the total number of students playing different sports from various schools. 6) If the ratio between the total number of boys to that of girls playing Hockey from school A and B is 7 : 3 and 5 : 3 respectively, then find the difference between the average number of boys to that of girls playing Hockey from both the schools A and B together? 7) Find the average number of students playing Hockey from all the given schools together? 8) Total number of students playing all the given sports together from school C is approximately what percentage of total number of students playing all the given sports together from school F? 9) Find the ratio between the total number of students didn’t play any sports from school A to that of total number of students from school D, if the total number of students playing all the given sports together from school A is 25 % of total number of students from school A and the percentage of students didn’t play any sports from school D is 80 %? 10) Find the difference between the total number of students playing Billiards to that of Volleyball from all the given schools together?